So sorry, life has been so busy and I have let blog land down. I am back and feeling I have so much to tell you. Where to start. - how about the newest quilt I have started. This is Star Struck a pattern by Bonnie Hunter at Quiltville star struck pattern. You can check out the link to the free pattern. At the beginning of November she said she was going to start her new scrap mystery quilt on Nov 18th and I want to do this year's mystery but then could not wait to get started. So I started this quilt. It uses fabric that is cut 2 1/2 " wide so it works well for jelly rolls. 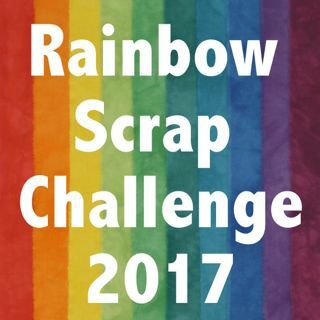 Mine is scraps and cut yardage. To check out the Introduction to the new mystery quilt check out Orca Bay Mystery. Some quilt friends on Face book are joining me. Are You going to do it? This little block was done from scraps years ago (>5 yrs) and hung on the side of my design wall. I thought someday I will have to do a lime green and purple quilt. Well Star Struck is it. I have about one third of the blocks done. You can see I can not use the little block but maybe I will put it on the back. Edmonton and District Quilter's Guild is tonight. Looking forward to see them all. 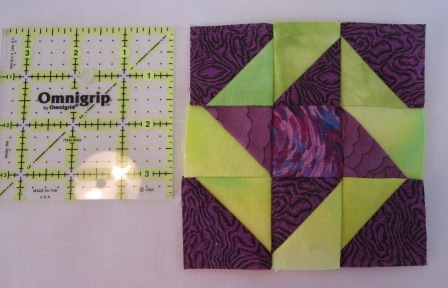 We have a raffle for quilters's Fabric bundles, some are jelly rolls and other charm squares. Maybe I will come home with more fabric. I'll take my money to buy tickets. We are also to get a big snow storm overnight. I guess I will be staying home and quilting tomorrow. Better go load up the next quilt on the machine. Love this quilt! Great colors - might have to make one like it myself! I really like the block - very pretty color combinations- I like the star struck quilt pattern too. Nice to see you back blogging..
Great meeting tonight but I did not win any fabric. Glad you ladies liked my quilt. I hope to get more done on Sunday. Okay, Cathy: you're on. I mean, I'm in -- or will try to be for the Orca Bay Mystery over on the Quiltville blog. 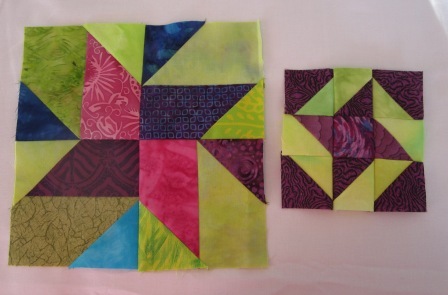 I have scraps, tons and tons of scraps -- some cut into squares, lots of 'strings'. I'm thinkin' I'll do *anything* to get these out of my house -- including make a bed quilt! So...here goes nuthin'! 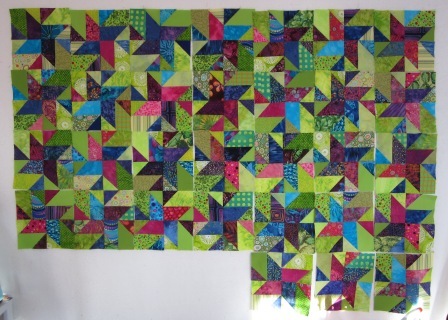 The green in this quilt really pops! Love the way this one looks!